Property 2: AGRITUR VAL D'Egoi, MIRACLE NICE QUIET LOCATION IN EVERGREEN! Property 13: Bungalow with private terrace in the town of Sunclass - ideal for families. Property 25: Bungalow with private terrace in the town of Sunclass - ideal for families. We enjoyed our stay in Ca' Brusada (the stone cottage) overlooking Lago di Garda. Our host, Giulio, was very generous and accommodating, looking out for us and providing fresh bread every morning as well as a great bottle of wine from his own farm. The setting of the cottage is really beautiful, with a grand view of the lake from the front door and a nice outside patio area. N.B. : The drive up to the cottage from the main road on the lake shore is not for the faint of heart! Very winding, twisted, narrow road - be sure you have a small-ish vehicle for your trip because a wide SUV or similar car would have a very hard time making it through some pinch points along the way. But the drive is worth it, and again, Giulio our host was great. We found the farm in full harvest mode, with Giulio and his helpers harvesting olives from the trees and preparing the property for a winter that will be there all too soon. Location is very handy for exploring the Lago di Garda area, including Toscolano Maderno, Riva del Garda, Sirmione, 'Salo, Brescia, and more. We made several day trips to these and other localities with little effort. 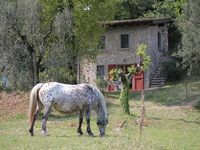 Enjoy your stay at the cottage or elsewhere on Giulio's property (I think he has some other accommodations at this agriturismo as well)!